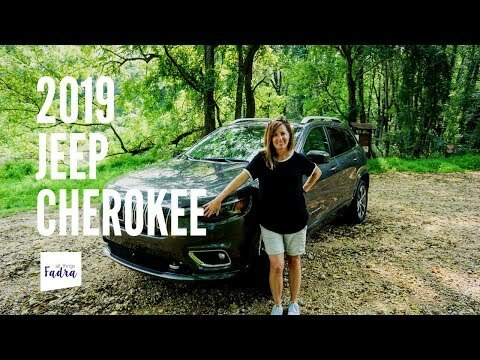 Come with me on a long road trip in the 2019 Jeep Cherokee Overland where I show you all the good stuff on the inside AND talk to you about how it drives. I might even get a little muddy. I’ve driven quite a few Jeeps and this has definitely been my favorite! I don't really care about cup holders, fancy upholstery, etc...Show me up front under the bonnet...I want to see what makes this thing tick. +Fadra Nally OK, got it. And by the way, I don't generally talk too much about the engine except for the drive experience. It's kinda my thing. 24 valves - hey, YOU try remembering all of this on camera and not making any mistakes! "25 valve V6"...Each cylinder has only 4 valves per cylinder. What is the price on this model, ? Great job ,my wife loves when woman do the reviews. ..she says men miss a lot of the most important details...we were looking at the grand cherokee. .. but after seeing your video she is strongly considering , this one ....thank you so much for your frank review. We are both retired so this might fit into our budget better. Jonnie Johnson II I wore my finest mom shorts just for you. +Fadra Nally Oh. Ok. That sounds great! Happy belated new year! 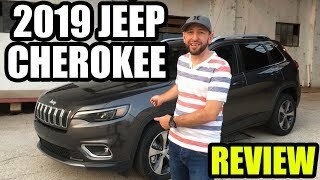 I’m definitely putting the Grand Cherokee on my list to review this year. You did a hell of a job with this review - really felt like you made a big effort to show us this car, it was great! Well, thanks!! I read all of my comments so I’m always trying to give the people what they want! I think I would choose the Limited over the Overland. But I defend the Cherokee. FCA has fixed most of what was wrong. It's still on my shortlist of 2019 new car candidates. I’m a luxury kind of girl so I’d go Overland all the way. 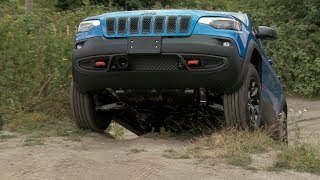 If I didn’t do Overland, I’d definitely do the Trailhawk. How was the engine power? How was acceleration from a stop? 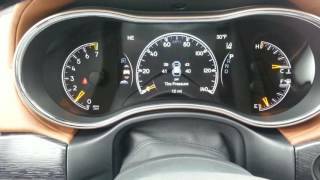 How was it at acceleration at highway speeds to pass? Did the transmission up-shift and down-shift responsively? Some complaints in the past have been about unresponsive transmission that feels jerky at times. Was there a lot of body lean in turns. How was the feel of the steering, the braking? Just took one out for a test drive. The transmission is very disappointing. 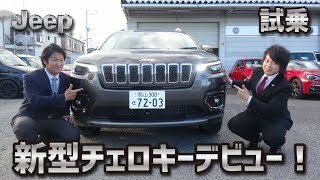 3.2 v6, trailhawk. I went to pass, the lag was absurd. A Critic once said about the jeep transmission, it is not sure what to do, I now understand what he meant. To bad, I could not live with that. Fair point. Honestly, the reason why I don’t talk about driving too much is because it’s a good driving experience. I usually only mention it when some is outstanding (like the acceleration of the Acura RDX or the sluggishness of the Jeep Compass). I did a fairly long drive in this vehicle for a week and didn’t have any issues with anything you mentioned. Sunglasses...it’s for sunglasses. 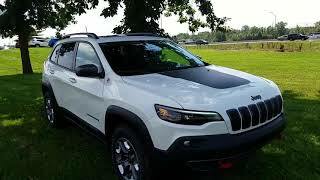 I just bought a Jeep Cherokee and I pick it up Monday. Good job with the demonstration. No Karen, there's a cubby up by the sun visor for your sunnies. I think it's for doobies.. yes, definitely doobies.. Thanks, Karen. Hope you’re enjoying your Cherokee! +Fadra Nally I think he's just wondering which cylinder gets the bonus valve. Also, how did you talk about the luxury without highlighting the hands free power lift gate? That's one of the best luxury features, IMO. Such a nice car - especially the Overland! Legs. Yup, I get to look at them every day. 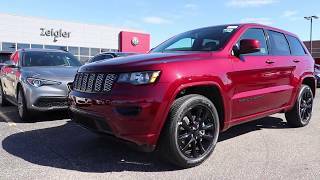 I am leasing my second Jeep Cherokee, this time I moved up to the Overland after a pleasant three years with my 2015 Limited and the new Cherokee is much improved and clearly is best in class as I agree with your accessment. . The quality, driving characteristics, comfort, reliability and overall value is noteworthy. Yes those front seats rival luxury brands in comfort and material quality. 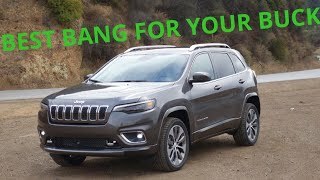 I continue to be impressed by the Cherokee everyday as it never stops exceeding my expectation. 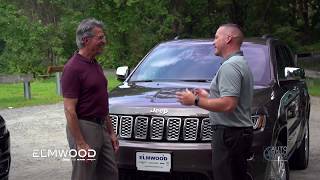 Most important, my wife absolutely loves this Jeep, as it offers everything the luxury brands offer, with ledgendary Jeep performance in a just right size. 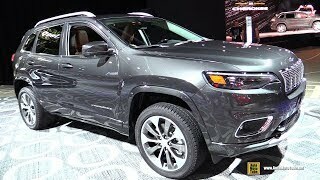 I would recommend the Overland Cherokee for a test drive before you buy or lease a luxury import SUV. 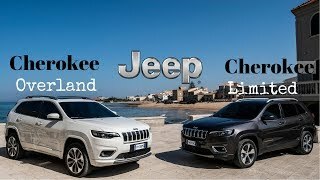 We did and we chose the Jeep as superior in driving dynamics, at least comparable comfort, more features and clearly a much better value than the luxury import. It's nice to hear from an actual Jeep owner. 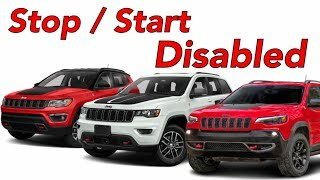 I've heard a few questions about Jeep reliability but if you're a repeat owner, then clearly you've had a good experience. After driving the Overland and the Trailhawk, I'm definitely an Overland kind of gal! It's okay. Legs aren't for sale. But it's a great choice to buy this car. It's one of the few I really didn't want to give back! WOW ! WHADDA YOU SMOKIN DUDE. 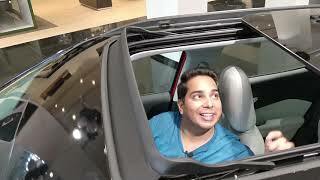 At 3:10 you asked for ideas for the storage compartment at the top. I am a very happy owner of a Jeep Cherokee 2014, and I use that storage at the top for my E-ZPass transponder. It works perfectly every single time, and there is no need to mount it on the windshield. I do the same and keep my insurance there so it's ready and easy to get and in view when I reach for. I hate when folks have to dig for there info so I like to have every thing ready just encase I get pulled over or need it. Yes it does. And it works, consistently, all the time! It's really good to basically forget that the E-ZPass transponder exists, setup an automatic refill online, and keep it hidden in that top storage compartment. Oh, really? It reads the EZPass even inside the compartment? If so, GENIUS!!! Thanks for sharing! Isn't she. I love watching Fadra. You got it goin on. Yeah, yeah, yeah. When you're "borrowing" a car from the manufacturer, you have to be careful what you do with the vehicle. It was a deep muddy puddle. And I was actually worried I would get stuck! It's a 3.2-Liter V6 24-Valve VVT (variable valve timing) engine. Hope that helps! What square, put a carpenters square on the wheel well and you will see the sides have an angle. 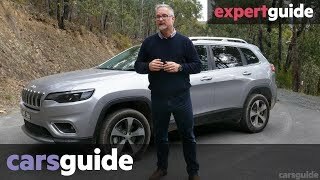 I see a trapezoid, the same trapezoid that you also see on the renegade, compass, grand cherokee and wrangler. The reason you notice the angle is different for wrangler is because it is common to put oversize tires on them which requires more room. I guess it's why jeep says " it's a jeep thing you wouldn't understand ". That explains the trapezoidal wheel well for the Jeep Wrangler (and fun fact too!) 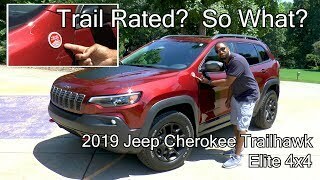 but doesn't explain the square on the Cherokee! Jeep states on their website the wheel wells are trapezoidal because the original 1941 jeep was and it is the heritage of jeep. Good theory. Not sure if I totally buy it but I'm going to research it now! 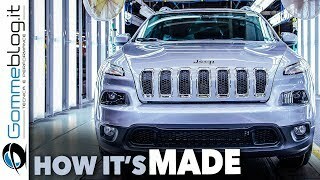 So like this Jeep and priced competitively,as you mentioned serious off readers would need the Trailhawk, good weekend. 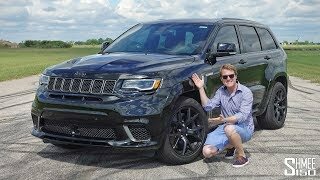 I'd love the Trailhawk but doubt I'd ever really spend serious time off road. I loved the 4x4 of the Overland! As a Land Rover owner, I'm not impressed with this Jeep. I enjoyed the fact that you finally demonstrated the driving dynamics. But, that small mud filled rut is not a good indication of off road capability. My 2005 LR3 can ford water, climb mountains and push stalled SUV's. I doubt this FCA Jeep imposter can match the Go Anywhere spirit of my Solihull brute. I am not judging your review. I love the process you use to review vehicles. As a Toledo, OH native I am a bit ashamed of what our hometown favorite has become. FunkoPope Fun1976 I have copied Wikipedia, but this is all a Cherokee is. Jeep made it to be a car it is today. 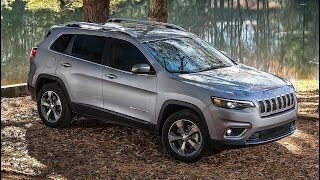 If it wasn’t for a sporty car like Cherokee, Jeep would’ve been killed of a while back, or at least wouldn’t be doing as well as it is now. +Brian Congratulations for copy and pasting Wikipedia. Your knowledge astounds me. Please tell me again how you locked yourself in a truck stop toilet stall. Nice review Fadra! And welcome to long island! Thanks, Ron! This is my third year going up to visit my friend in Westhampton Beach. So picturesque and a great excuse for a road trip! +donna lopez Exactly this is a Jeep Thing, Every model, every trimm since 1941. The wheel wells are not square they are called trapezoidal (trapezoid is an actual shape). That has been the style since 1941 it is the jeep heritage. Alot of things jeep does is a throw back to the origins where it all began with the WWII military jeep. I hate that plastic cladding too. You will find it on the Trailhawk but I'm guessing it's because you wouldn't want all that paint getting scraped up when you go off road. BTW with the right product, you can restore that faded black cladding - I've done it! 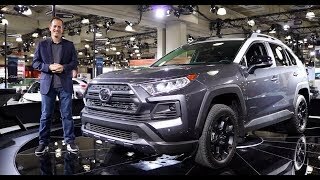 Is the 2020 Toyota RAV4 TRD the ULTIMATE off road CUV?